CBG Systems specialises in the design, manufacture and installation of lightweight, panelised A60 structural fire protection (SFP) for marine applications. CBG’s Rapid Access system is a unique panelised fire insulation solution, which has been installed in more than 100 vessels, including Safety of Life at Sea (SOLAS) and High-Speed Craft (HSC) classes, commercial ships and navy frigates. Within the rapid access SFP family, CBG offers different variants for different ship specifications. CBG Systems has a suite of solutions for real-life installation scenarios. These include recesses for lights, sprinklers and detectors, as well as inspection hatches and fire doors. The panelised configuration provides easy access to the ship structure through panels, which allows non-destructive maintenance / inspections, minimises potentially hazardous loose fibres and reduces wastage, weight and installation labour costs. CBG’s Rapid Access systems are built to last and withstand all challenges presented by a voyage. The rigid design helps reduce insulation damage before ship hand-over. 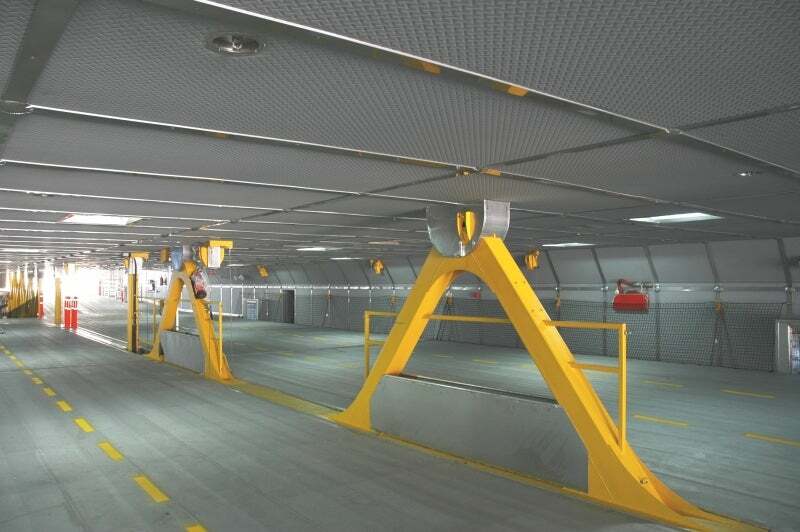 Rapid access systems are robust and can withstand the tough operational conditions of vehicle decks, engine rooms and other areas subject to high traffic. Panels are quick to install and reduce shipbuilding time and cost. The system framework can be installed concurrently with other services, and Rapid Access panels offer fast close-up at the build. The Rapid Access system can be installed in under two hours per square metre. Rapid Access systems feature flat, stiff panels with attractive embossing. Ship services such as pipe work and electrical cables are hidden behind the panels providing a clean finish and quality aesthetics. In contrast, conventional insulation systems either leave services exposed to passengers and potential damage, or require installation to work around these, further increasing material and installation costs. Stiffeners in the structure of the ship greatly increase the surface area of the structure, typically upwards of a factor of 205% of the planar area. Conventional profile wrap systems, which are typically high temperature insulation wool blankets such as alkaline earth silicate wool, must be installed to the profile of the stiffeners. The quantity of material used for installation and off-cuts, along with installation time is increased dramatically. CBGs panelised fire protection systems are installed flat across the stiffeners, on the flat plane of the division, greatly reducing the amount of material required, and minimising minimum off-cut or wastage. This results in CBG being able to supply one of the lightest SFP systems on the market, increasing potential payload carried by ships or ship economy / reach. The Rapid Access systems overcome costly maintenance issues by providing easy installation and removal of panels in-service. Rapid and non-destructive access to services and the ship’s structure drastically reduces time and cost to undertake maintenance, inspections or routine testing. CBG Systems is pleased to announce it has signed an exclusive agency agreement with Netherlands-based company Van Dam Maintenance & Repair for the sale, maintenance and servicing of CBG products across Europe. CBG Systems is pleased to announce that it has secured a contract for the manufacture and supply of Moonraker's antenna systems for the Italian Naval law programme. CBG Systems are pleased to inform you that we have expanded our product range to include Moonraker products.